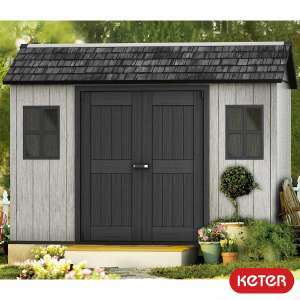 was looking at this Keter garden shed come summer house for the garden, it has been £1100 for some time, but recently Costco have taken £200 off the price until Sunday, Grab a bargain! 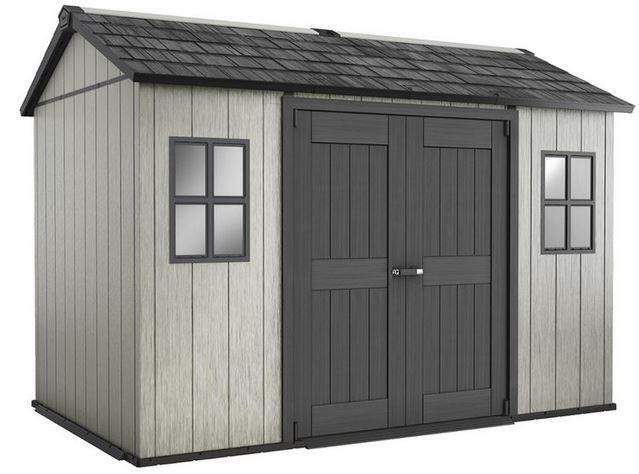 The Oakland 11ft x 7ft 6" Side Door is an outdoor rustic chic-style garden shed with a fine looking wooden texture. The shed benefits a high ceiling to allow an adult to easily move around inside, specialist duotech walls that enables you to customise due to its paintable walls, wide double doors that allow for easy access, a skylight and Victorian-style window. Built to last, with a double wall, steel reinforced, weather-resistant construction this Oakland Shed also features a heavy-duty floor that is strong enough to support heavy items such as ride on lawnmowers and a strong roof that can support snow loads of up to 100 kg/sq m. This shed is also easy to assemble with pre-cut tongue and groove panels and comes with a stainless steel locking system for additional security (lock not included). This looks quite nice but I can't help thinking I could build something a bit more substantial with a grand's worth of timber and a little effort and time. Any idea if this is the total price or if VAT needs to be added? Think carefully before purchasing. The quality of some of their garden storage benches is very poor and Keter do not carry spares for everything. Think carefully before purchasing. The quality of some of their garden …Think carefully before purchasing. The quality of some of their garden storage benches is very poor and Keter do not carry spares for everything. This looks quite nice but I can't help thinking I could build something a …This looks quite nice but I can't help thinking I could build something a bit more substantial with a grand's worth of timber and a little effort and time. Anyone considering buying this might also want to review the Duramax alternative. I got the 10 X 8 one on sale via Amazon at £516.88 (Sept 2017). I have to say that it is of a very solid build. If the Keter one posted is of same quality - it will be solid, but you do have to make sure you have a level surface to build on (and atleast two people to build it). Mine took 2 adult males, one a tradesman and the other a novice DIY-er (me), 2 full days to build. Would this be suitable as a small family home? Just make sure you treat them nice. After the Brexit, the parts maybe reversed. Just make sure you treat them nice. After the Brexit, the parts maybe …Just make sure you treat them nice. After the Brexit, the parts maybe reversed. Why are an anti-Semitic movement like BDS the 'right way to go' ? Keter is just about ok for outdoor storage boxes and that’s about it. Quality is not tip top, flimsy, easily breakable, don’t fit together properly and just poor quality. A plastic summer house at £900 I wouldn’t bother. But the plastic does discolour and seems to go quite brittle over time; seem to get about 5-7 years out of Keter storage boxes before they start breaking down. I had one about 10 years back that started out fine, but was nearly translucent by the end. But the plastic does discolour and seems to go quite brittle over time; …But the plastic does discolour and seems to go quite brittle over time; seem to get about 5-7 years out of Keter storage boxes before they start breaking down. I had one about 10 years back that started out fine, but was nearly translucent by the end. a) identifying and laying out all the pieces, and b) having put two roof support in opposite places and discovering them after done a few extra steps (so had the undo some work). We made sure everything was done in exactly the right order, put in the right position and secure (you can fudge things a little if you want to, but we did % by the instructions book to be certain). I've seen the Keter shed in Costco's, the Duramax in my opinion is stronger. The shed is solid (as is the decking base I built - and which cost as much as the shed). I don't see the shed budging by even the strongest of winds (touch wood, or should that be vinyl ). Besides it does have a good guarantee (I want to say 10year, but I can't remembered 100%). Spent another £140 buying solid freestanding shelves, before I started putting all my goods in (much of it bought thanks to HotUKDeals!). It can quiet easy be a home gym or summer escape room / study room. Carpenter. What took the time was: a) identifying and laying out all the …Carpenter. What took the time was: a) identifying and laying out all the pieces, and b) having put two roof support in opposite places and discovering them after done a few extra steps (so had the undo some work). We made sure everything was done in exactly the right order, put in the right position and secure (you can fudge things a little if you want to, but we did % by the instructions book to be certain). 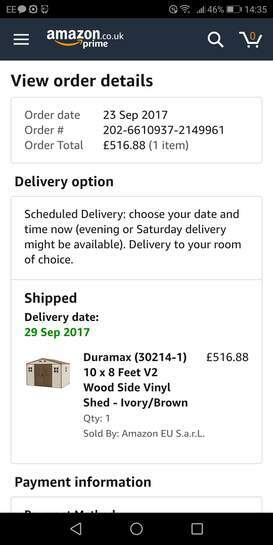 I've seen the Keter shed in Costco's, the Duramax in my opinion is stronger.The shed is solid (as is the decking base I built - and which cost as much as the shed). I don't see the shed budging by even the strongest of winds (touch wood, or should that be vinyl ). Besides it does have a good guarantee (I want to say 10year, but I can't remembered 100%). Spent another £140 buying solid freestanding shelves, before I started putting all my goods in (much of it bought thanks to HotUKDeals!). It can quiet easy be a home gym or summer escape room / study room. Good grief, that is Soviet Style ugly. A Carpenter and you built a plastic shed, you should have you chisel blunted! Yeah but pretty sure a wooden one could look better and is more environmentally friendly. He was assisting me for my shed (not his). His shed, wood built is about 15 X 20. Yeah but pretty sure a wooden one could look better and is more …Yeah but pretty sure a wooden one could look better and is more environmentally friendly. You can’t melt plastic and recycle it anymore? Wood is more eco friendly in production and recycling than plastic...obv.